Spring is FINALLY here! It is my favorite time of year, there are so many nice days ahead of us! I am getting ready for a workshop at my farm in June. Painting outdoors is a great and worthwhile activity. There are so many reasons that artists love to work directly from nature, en plein air. Nothing beats setting up your easel in front of nature, mixing colors on your palette and working on a canvas. The birds sing to you while you mix and paint the vivid colors of the landscape. As you make brushstrokes on your canvas the country air refreshes you, and at some point you realize that you are truly living in the moment. I teach classes that will give you the skills that you need to confidently get outdoors and paint. I have worked with so many amazing students over the years, and have seen them create striking paintings. I have had people come to my chicken coop studio who have not painted since their school days, that left with tears of joy because they never thought that they could paint. It just took a class to show them that they could. I want you to succeed. I have put together a curriculum that shows you what you need to pay attention to, and allows you to forget about everything else and immerse yourself in your artwork. 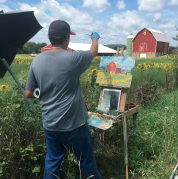 My workshops are perfect for the absolute beginner, who wants to try out plein air painting for the first time because the concepts are easy to grasp. The classes are also perfect for advanced painters, because the concepts can be infinitely built upon. If you are an beginner, and do not have supplies, I am offering a supplies package to use one of my easels and all the supplies you need for the weekend class for only $25. This is a great opportunity to give it a try! I want to check in, about some calendar dates, with those of you who are thinking about taking a class. If you have any interest in taking one of my workshops, at my farm in Rock Springs, could you please send me an email to kylemartinfineart@gmail.com with which weekend works for your schedule? I will also be teaching classes at the Peninsula School of Art. These dates are set, and the June 3 and 4 class is FULL. Thank you for allowing me to share my paintings and my classes with you. I look forward to seeing you soon.